Lowbrow US sequel to one of the biggest comedies of recent years, starring Mark Wahlberg and the voice of Family Guy creator, Seth MacFarlane. When it comes to innuendo, American movies generally make the Carry On series look like Shakespeare and Ted is no exception. 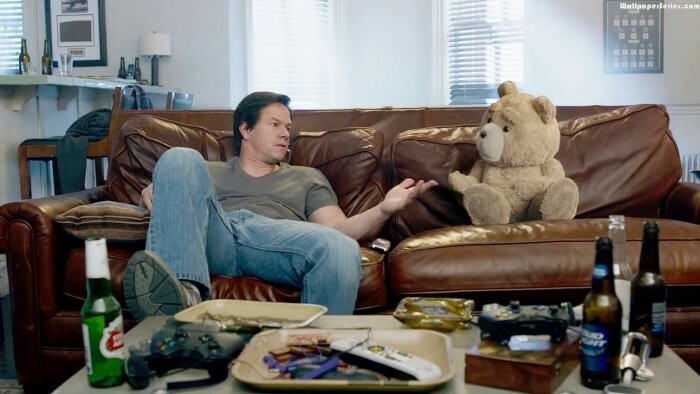 The subtleties of the genre don’t just go out the window, they tend to take the whole building and half the block with them ..
For anyone who hasn’t seen it, the original Ted was centred on working class John Bennett (Wahlberg), an honourable but limited working class everyman from Boston. When I say that, I don’t mean he’s dumb .. he just likes a simple life with no pressure and plenty of time to watch sport and get high with his best friend, the eponymous Ted. You don’t have to watch the first movie to appreciate this one – it’s not like there’s any kind of major story arc going on. In fact, Mila Kunis – John’s love interest in the original – isn’t even in Ted 2, and that’s kinda the point: as Ted finally gets his act together by deciding to marry his long-term girlfriend, Tami-Lynn, John’s life seems on hold. Divorced by the love of his life for being too much of a bum, he is yet to move on, seemingly inable to process what’s happened. I can see why so many people can relate to this and many other American comedies. They’re lowest-common denominator films where we all get to laugh at the loser. For a couple of hours, we get to escape from our own lives and giggle, snort and guffaw at the slapstick on the screen in front of us. Ninety nine times out of a hundred, the loser actually ends up winning too, so we end up feeling better about ourselves for there is always hope in Hollywood. 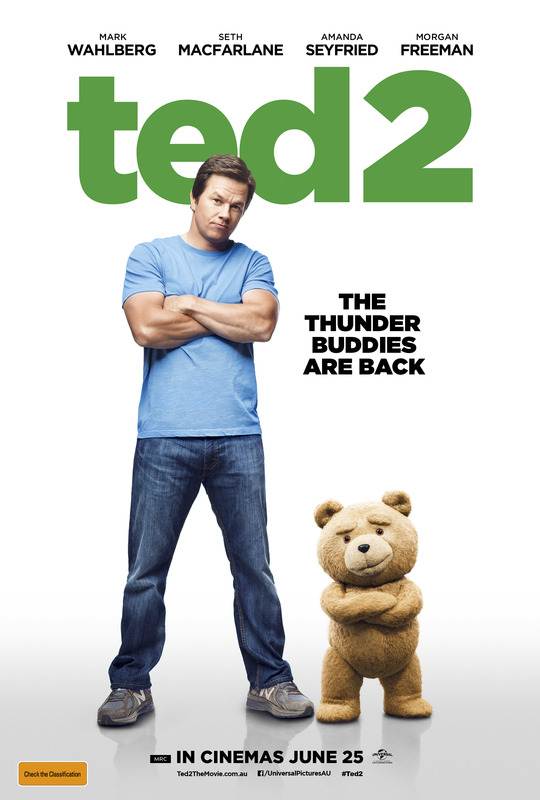 Compared to some of the output from the likes of Will Ferrell and Vince Vaughn, Ted 1 and 2 are wittier, sharper and more observational in the same way that the Airplane! series was in the early 80s. Both reference cultural themes of the day and both reward repeated viewing as there’ll always be a detail or a visual gag that you may have missed first time round. Having said that, we’re still talking about knob, poo and drug jokes – it’s not exactly the Coen Brothers, after all. To be fair to McFarlane, he does have his finger on the pulse of America in the same way that the creators of another adult cartoon – South Park – have done before him, namely Trey Parker and Matt Stone. This is satire of a (very limited) kind, sending up the nation itself as much as any particular type of person living there. Back to the story, for there is a story to be told here, believe it or not. In a nutshell, Ted’s marriage to Tami-Lynn is not legally binding for he is not considered a person in the eyes of the law. He is property, much like a car, a dog or a house. To correct this, the less-than-dynamic duo decide to hire a big-wig lawyer to challenge the ruling, which will allow Ted and his wife to adopt a baby (they can’t actually have a real baby for the simple fact he is a toy and has a similar problem to an Action Man in one important regard). Along the way, other routes to babies are considered and indeed pursued. I think you can see where this is going .. yep, the sperm bank. But that’s not before they try to “utilise” the most heroic men they can think of – and I chose that term very deliberately. When I saw the first movie, I was disappointed. The levels of hype surrounding it and the fact that Wahlberg was in it (I’m a fan of his work, though I know he’s no Olivier) meant that it could never be as good or as funny as people had made out. I don’t particularly enjoy low-brow comedy in general, and I actually found a lot of the film pretty offensive. But then MacFarlane is the master of the un-PC, almost like a US version of Jeremy Clarkson. If there’s a target, he’ll aim for it no matter how easy a shot. If there’s a smutty joke to be made, he can’t resist it. If there’s a minority to bash for a three-second gag, he’ll pick up the bat. If there’s a bodily function to lampoon, an -ism to send up, or a celebrity to mock, he is your man. The common man. The man of the people. The guy who says what everyone else is thinking but dare not say out loud. Am I right, or am I right, oramIright ? There is always a line with any kind of humour – even Jimmy Carr knows this – but that line is different for every individual. What I laugh at may horrify you, while my own recoil at a particular subject may make you wonder what’s wrong with me. It’s a personal thing and MacFarlane sets out to offend, well just about everyone, really. So long as you go in with that mindset, you’ll be okay. This is mindless, stupid comedy. This is also offensive, Hollywood crap and one of the reasons half the population of the planet (and probably a lot more than that) hates America and everything it stands for. This is also juvenile, harmless fun. Depending on where you stand .. So you pays your money, you takes your choice. The night I saw the film, the auditorium was full: it was a members-only preview ahead of the general release later that same week. Everyone roared their heads off. There were a few collective “oohs” and “aahs” at some of the naughtier stuff, but overall it was a big, big hit. You know what you’re getting with MacFarlane. 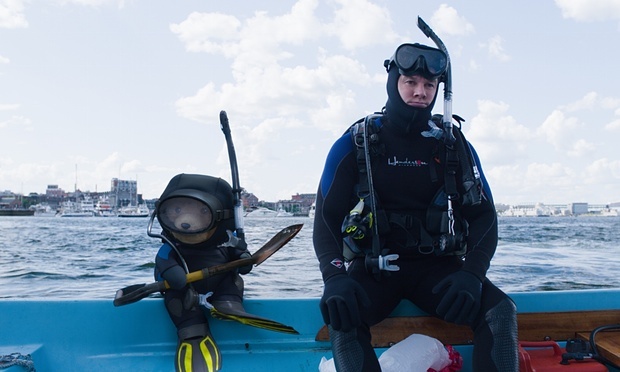 You know what you’re getting with Ted 2. You already know whether you want to see this movie or not and nothing I say about it will make you change your mind. But I also felt bad for enjoying it. As the Americans say so often: go figure ..